Dave Edwards has made 29 appearances for Wales. 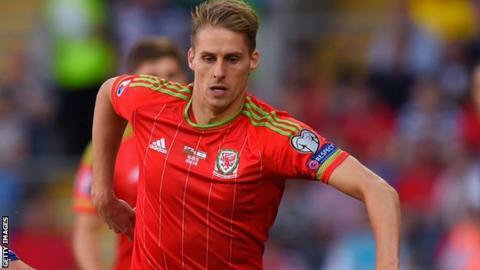 Midfielder Dave Edwards could miss Wales' final Euro 2016 qualifying games with Bosnia Herzegovina and Andorra. Edwards injured a knee in Wolverhampton Wanderers' 0-0 Championship draw with Brighton on Saturday. Wolves head coach Kenny Jackett, the former Wales international, says that Edwards faces time on the sidelines. "The tackle in the first half on him was quite a bad one. He has hyper-extended his knee. It looks like it'll be several weeks," he told BBC WM 95.6. Wales manager Chris Coleman also has injury worries over Real Madrid forward Gareth Bale and Liverpool midfielder Joe Allen. His team lead qualifying Group B, and need one point from their remaining two matches to clinch qualification. Wales have not qualified for the finals of a major tournament since the 1958 World Cup in Sweden. Edwards started the qualifiers against Cyprus and Israel earlier this month when Wales were without Joe Allen and Joe Ledley. But Ledley has recovered from his hamstring injury and was on the bench for Crystal Palace's 1-0 defeat at Tottenham Hotspur on Sunday. Allen returned to full training with Liverpool last week, while Bale has a strained calf muscle and faces a race against time to be fit for the qualifiers. Emyr Huws missed the qualifiers against Cyprus and Israel with an ankle injury. But the Wigan Athletic player, on loan at Huddersfield, made a goalscoring return in the Terriers' 2-1 Championship win at Charlton last Tuesday.